A newly observed form of cancer in Tasmanian devils can be spread by biting, researchers say. With eight reported cases across southeastern Tasmania, the cancer causes large facial tumors in infected devils and can result in death within months. This is the second transmissible cancer known to affect the species. The other form, which was first observed in 1996, is also spread via bites and results in facial tumors, but is genetically distinct. Known as devil facial tumor disease, the parasitic cancer has been blamed for significant population declines in recent years, as devils are known to bite each other frequently during mating and feeding. In 2008, the IUCN categorized the Tasmanian devil (Sarcophilus harrisii) as Endangered, noting that some individual populations are now a mere tenth of their original size. Some devils are immune to devil facial tumor disease, and captive breeding programs have been initiated as a last-ditch effort to ensure the species' long-term survival. "Until now, we've always thought that transmissible cancers arise extremely rarely in nature, but this new discovery makes us question this belief," the University of Cambridge's Dr. Elizabeth Murchison, senior author of a new study about the cancer, remarked in a news release. 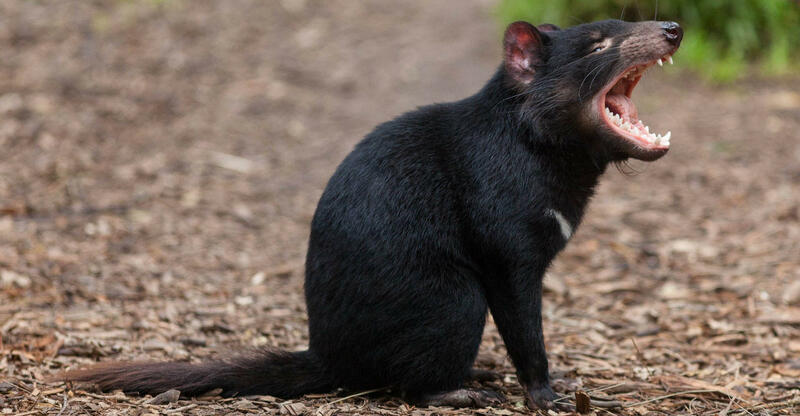 "It makes us wonder if Tasmanian devils might be particularly vulnerable to developing this type of disease, or that transmissible cancers may not be as rare in nature as we previously thought." Similar transmissible cancers have also been observed in dogs and soft-shell clams. The research, from the Universities of Cambridge and Tasmania, is detailed the journal Proceedings of the National Academy of Science.